A parasite and sporadic in its occurrence, this curious form of plant life has left no trace of its occurrence in ancient deposits. Its present distribution in the North Temperate Zone is Europe, N. Africa, and Siberia. In Great Britain it is found in S. Devon, Somerset, N. Wilts, Dorset, the Isle of Wight, N. Hants, Sussex, the Thames province except E. Kent, Middlesex, Anglia, E. Gloucs, Worcester, Warwick, Leicester, Chester, Westmorland. Dodder is a parasitic plant which grows on nettles and vetches and other plants, and is as a rule found on heaths and commons, being frequently found upon Furze. But its occurrence is extremely sporadic, and it cannot be said to be common anywhere, though it is more especially characteristic of ericetal tracts in the south of England. Interesting in its mode of subsistence, aerial, and not issuing from the ground, adhering to the upper parts of other plants, from which it draws its support, as in the case of Bartsia, Euphrasia, Orobanche, etc., it is also remarkable in not turning like most climbing plants from right to left with the sun. If planted in earth it will not grow. The seeds after falling on the ground germinate in the soil, develop a slender root and a thread-like stem. There are no cotyledons. By the aid of the twining habit or circumnutation it later twines itself upon a furze stem, which forms its host, and tendril-like twines round it. Suckers are developed, and these bore into the woody layers of the stem of the host plant, and henceforward serve as the organs of absorption. The root no longer necessary dies, and the plant is therefore now a true parasite. The stems are thread-like, reddish, branched, leafless, twining. The flowers are white, streaked with red, clustered, stalkless, with an erect calyx, shorter than the corolla, with spreading, blunt segments, fleshy at the base. At first cylindric the tube of the corolla, which equals the short, broad lobes, is spreading and swollen, with closely-pressed scales within. The seed does not open by lobes, but the embryo is spirally coiled. The plant grows to a length of 2 ft. It flowers in August and September, and is annual. The anthers and stigma ripen simultaneously, self-pollinating the plant. The flowers are cleistogamic. The corolla is spreading, with a ring of appressed scales below the stamens, which are included, and inserted on the corolla tube. The styles are also included. The flowers are small and globular, and unattractive to insects. Honey is secreted at the base of the ovary, protected by 4 scales. Photo. 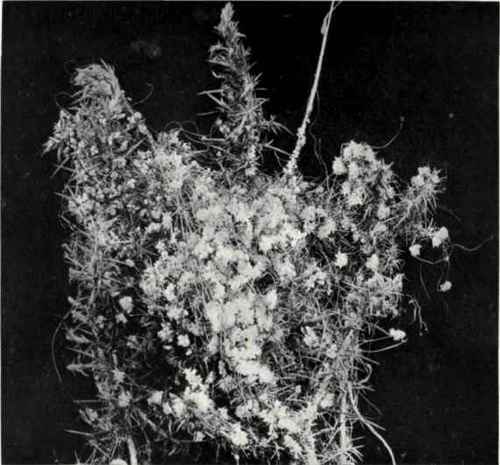 Flatters & Carnett - Dodder (Cuscuta Epithymum, L.), To Show The Habit Of C. Curopaea The capsule splits open, allowing the seeds to fall around the parent plant. Dodder is a parasitic plant growing on heath plants after the seed has germinated in the soil, usually a humus-loving plant and rich in humus. A beetle, Smicronyx jungermannioe, is found on it. Cuscuta, Mathiolus, is from the Arabic Chasuth, and the second Latin name indicates the distribution of the plant. It goes by the name of Beggarweed, Bind, Devil's Guts, Hailweed, Hairweed, Hale, Hell, or Hairy-bind, Hale-weed, Fodder, Scald, Scaldweed, Strangle Tare. The name Scald is from the scalded appearance it gives to bean crops. The name Devil's Guts is derived from the thread-like stems which wind round other plants and strangle them. "Hellweed grows upon tares more abundantly in some places, where it destroyeth the pulse or at least maketh it much worse, and is called of the country people Hellweed because they know not how to destroy it." Essential Specific Characters: 222. Cuscuta europoea, L. - Stem yellow, filiform, branched, leafless, flowers whitish-yellow, clustered, corolla longer than the calyx, scales appressed, stamens included.